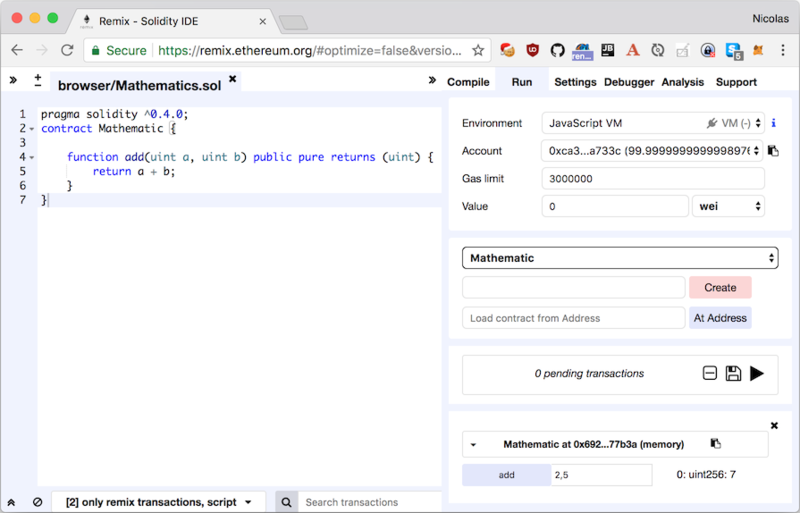 In Part 2 of this series on blockchain for developers, we take a look at how to get started writing smart contracts using the Solidity language. In the latest post, the required infrastructure to do something on Ethereum was set up. Now is the time to roll up our sleeves and start writing some code on it. In this post, I'll show how to write a trivial contract. What's a Smart Contract Anyway? That doesn't tell us much. My understanding is that on the blockchain in general, and on Ethereum in particular, smart contracts are just code. Which is a good thing, since we are developers, and writing code is our bread-and-butter (or at least it should be). I've had not so great experiences with both Python and C.
It seems to be the most used language. The documentation is solid (pun intended). An IntelliJ plugin: To install the plugin, go to IntelliJ IDEA > Preferences > Plugins. Then click on the Browse Repositories... button, and search for Solidity. After restarting, you can select to create new Solidity.sol files. Last but not least, one can try the online editor, called Remix. Remix can also run the compiled code on a limited set of networks and offers a debugger, which is a good option to start with. Let's just write a contract that adds two unsigned integers. This is simple, but it allows us to go further easily. A Solidity file starts with meta-data telling about its version. A Solidity file consists of a contract. Contracts bear a striking similitude to the concept of classes in other languages (such as Java). They can have both state - attributes and behavior - methods. They can also be abstract. In addition, they can have members specific to Solidity, Events, to interact with them. A pure function is a concept inherited from Function Programming. In FP, its return value depends solely on its input parameter(s) and has no side-effects (such as logging, writing to a context, etc.). Note that the state refers to the state of the Blockchain. It means that the Blockchain is not only an execution environment for contracts, but can also be seen as a database of sort - though an expensive one (more later). The easiest way to test the contract is to use Remix (see above). Create a new .sol file and name it Mathematics- or reuse the default one. As opposed to Java, there's no check that the contract's name matches the file's. On the left side, notice the menu:Compiler tab. By default, the Auto compile checkbox is enabled. Go to the menu:Run tab. Now, with the Mathematics value selected, click on the pink Create button. A new block should appear below: it's our new "virtual" smart contract. Notice the add button, that's the way to call the method. Just fill in 2 integers, separated by a comma, and click it. The result should be displayed on the left side of the method block.